Sick of the bacon-on-everything trend yet? It’s gotten a bit silly, hasn’t it? It can certainly be argued that this trend directly corresponds to the recent general improvement of bacon quality (so many hardwood smoked bacons…take that Oscar Meyer!) in America. However, this trend has also resulted in people thinking it’s a good idea to give bacon lovers remarkably silly bacon-related gifts, and enthusiasts producing improperly made bacon ice creams (protip: a bit of rendered bacon fat in the mix is a good idea, but don’t mix the bacon bits into the ice cream until right before serving). This has cast a shadow of the wonderful world of bacon. Well, overexposure will do that. But there is hope, my friends. 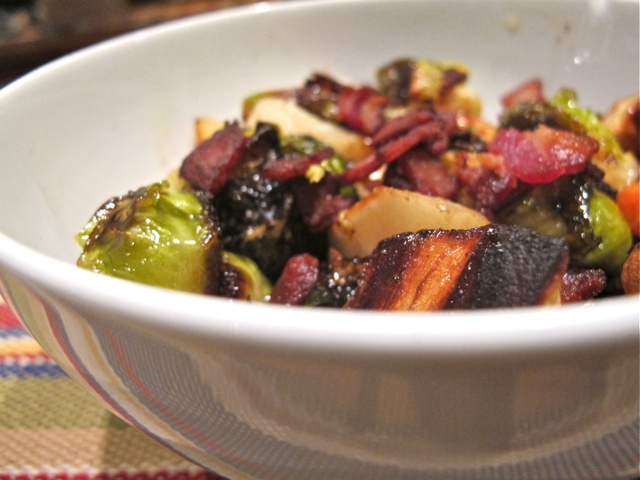 That hope lies in another trendy tidbit of food: the once hated Brussels sprout. Everyone loves a Brussels now (almost). Properly cooked, they’re quite terrific. So why not combine the two, add some complimentary root vegetables, and toss in a maple syrup vinaigrette? I’ve conducted an experiment. Result? Success. Grand success. Render 1/2 lb. Diced Bacon. 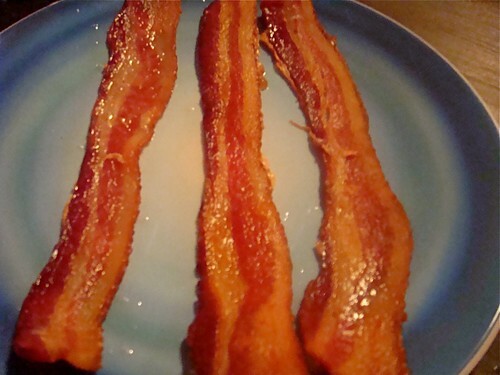 Separate cooked bacon from rendered fat. Save both. Add ALL (!!!!) the reserved bacon fat to the bowl, plus salt and pepper. Mix thoroughly. Transfer to a baking sheet, and roast in a 425F oven for 35-45 minutes. Everything should be nicely browned. Sprouts should be crunchy–not soggy. 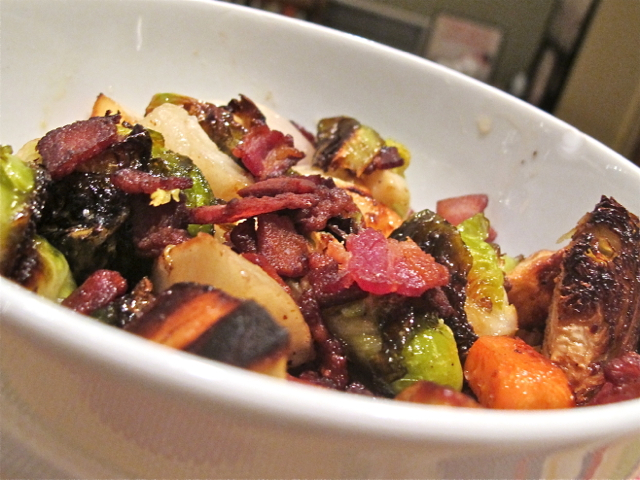 Toss roasted vegetables with the vinaigrette and reserved bacon bits. Add salt if necessary. Back from an extended vacation. I’m sure y’all had a hard time sleeping while you were waiting for the next post. Well, sleep now, friends, sleep now. The new post is here. I spent Saturday morning cooking in the Chef’s Demo Tent at a local farmers’ market (Farmers@Firehouse, sponsored by Slow Food Pittsburgh). I decided to challenge myself by not planning anything in advance; I was going to let the market dictate what I should make. This could sound daunting to some people, but I thought it would be a good test of my creativity. And it was. It was exciting for me to walk around the market, choose delicious-looking food, and then immediately start preparing it. What a wonderful way to cook! We’re in a bit of transition in Pittsburgh–summer fruit and veg are on their way out, but the autumn harvest is yet to be bountiful. No matter. 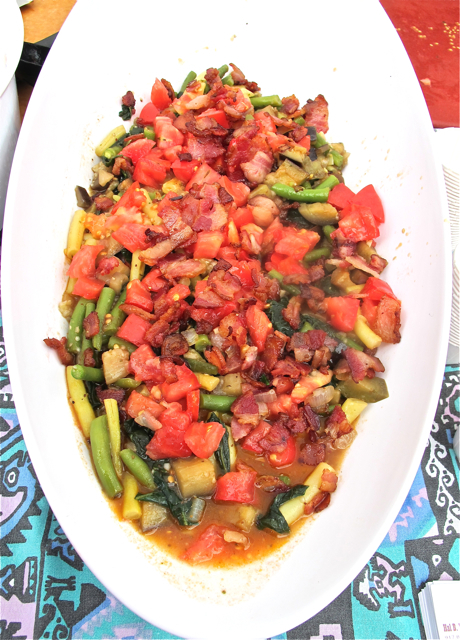 I was able to find a great combination of ingredients: green & yellow beans, heirloom eggplant, tender kale, onions, ripe tomatoes, and locally produced bacon. When bacon is crisp, remove from pan. Leave 2-3 Tbs. bacon fat in pan. Boil for 10-15 minutes, or until tender. Plunge cooked beans into ice water until ready to use. Boil one bunch Kale (cut into strips) the same water. Plunge kale into ice water too. Once eggplant is cooked, it’s time to assemble. 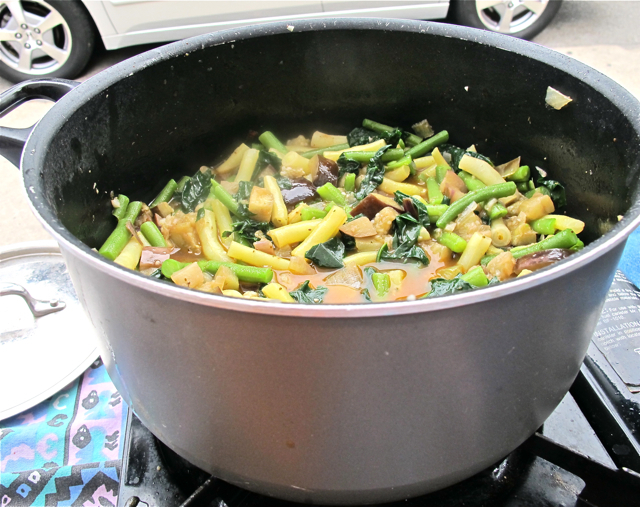 Simmer for 5-10 minutes, and thicken if desired. *I was cooking on the fly, so I wasn’t measuring anything at all, so you’re going to have to challenge yourself to create balance! 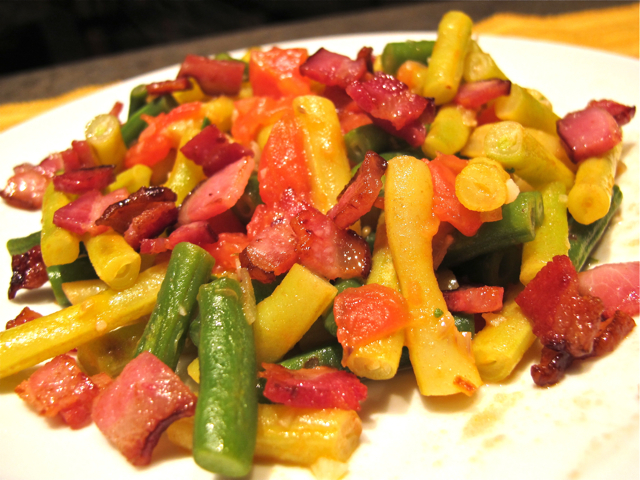 * You can use any combination of fresh beans: green/yellow/purple/wax. * The time for ripe heirloom tomatoes is fading, my friends. I think this will work with a quality canned tomato, but it won’t be quite so sweet. I hadn’t planned on posting two recipes in a row that were basically titled X and Y. It’s not a new theme, promise. I actually had a few recipes lined up to publish, but I just got a fancy-pants new camera and wanted to show off a photo of the first thing I cooked since purchasing this camera. I’ve come to realize that as much as I think a food blog should be about content, pretty pretty pictures are also very nice. We do eat with our eyes and all that. So, perhaps my new camera will inspire new pretty pretty pictures. But honestly, for me it’s all nonsense if the food doesn’t taste good. Visual stimulation means nothing without gustatory satisfaction. This dish is both visually and gastronomically pleasing. Hooray! Immediately plunge beans into ice water after boiling. Once bacon browns, remove it from pan. Leave 1.5 Tbs. Bacon Grease in pan, reserve the rest for other delicious things. 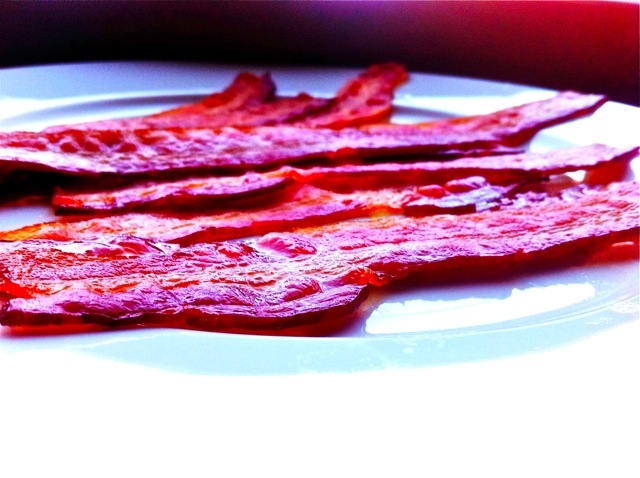 Because sometimes you have to take a study break and post pretty pictures you took of delicious bacon. 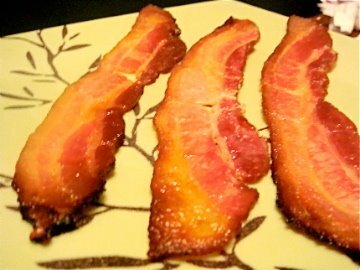 How does a person make this delicious bacon? Magic, of course. Magic did help though. Three cheers for photo imaging software. And three more for having it designed so I could figure out how to use it. When Thomas H. Palmer wrote “If at first you don’t succeed, try, try again” I doubt he was thinking about turning uncured pork bellies into bacon. (He was encouraging school kids to do their homework.) It’s good advice, though. My first attempt at curing bacon was a bit of a failure. It was a great first try, but too too too salty. So I tried again. And this time, it turned out much better. Don’t be intimidated by the length of time involved. You’re not actually doing much. Honestly, the most difficult thing about this project is slicing the meat to into strips. Wash and pat dry pork belly. Leave pork in celery juice for 48 hours, turning occasionally. Remove pork from juice, rinse, and pat dry. Turn it every day, draining excess liquid. After one week, rinse and dry pork. Smoke, over very low heat, for 6 hours. Slice, and cook as you would normally cook bacon. 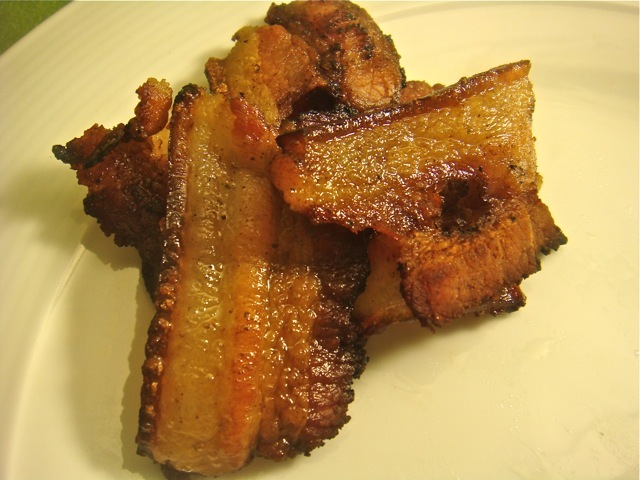 *Uncured pork belly can be a bit of a challenge to find. Best bet is to ask a neighborhood butcher. Yes, there are still some out there. I got an amazing cut from McCall’s Meat and Fish Company. You really will notice a difference in quality. Wrap a cookie sheet in foil. Strictly speaking, you don’t have to do this, but it will save you a whole lot of cleaning up. If you’re like me and hate doing dishes, you’ll want to do this. If you have parchment paper, you can add a layer of that over the foil for more even cooking, but, no worries if you don’t. Place a single layer of bacon. Cover the bottom of another pan with foil, place over the bacon, and weigh that pan down with bricks, rocks, bobble-heads, whatever. I know it seems like a bit of work- trust me, the bacon will cook more evenly, and it will be a snap to clean up. Put the whole hullabaloo into a 350 degree oven. Cook for 8 minutes, rotate the pan 180 degrees, and then cook for another 8 minutes. 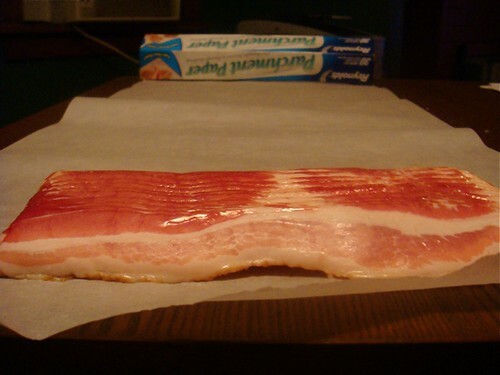 Remove the bacon, pat down with paper towel, sit down, eat bacon. 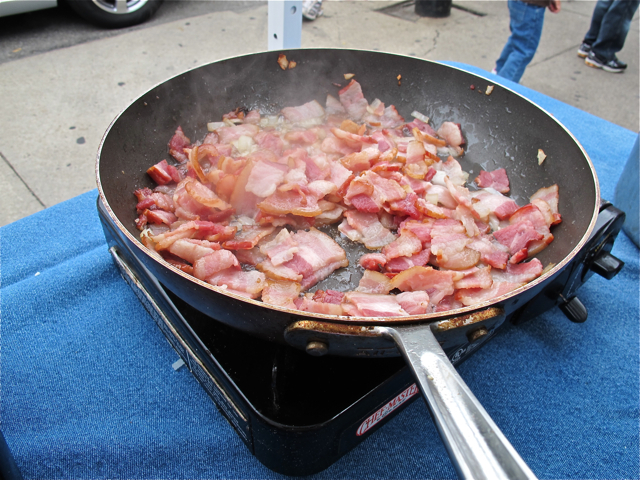 You can strain the rendered fat and use it for lots of tasty things, like cooking eggs to go with your bacon. Do it! Note: Cooking time will depend on the thickness and quality of your bacon. I’d recommend a thicker cut, and try to avoid the over-processed Oscar Meyer type bacon. If it’s undercooked after the cooking time, just take the top sheet off and cook another minute or two. I’ve been eating so much “healthy” food recently, I nearly forgot what’s really healthy. Bacon! 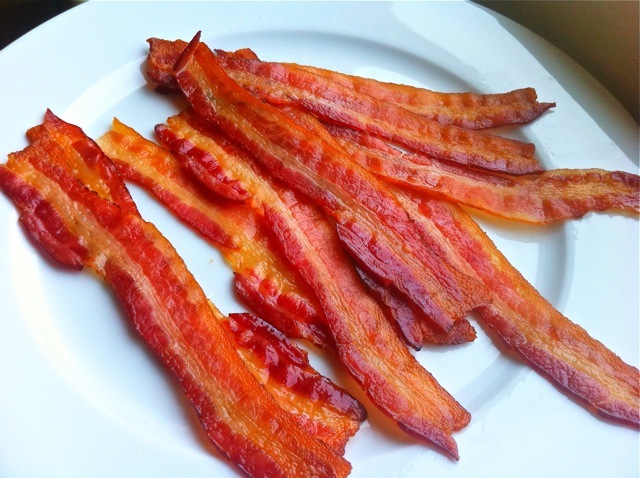 So, I thought- “How can I make bacon really HEALTHY”. Deep fry it, of course. I’ve already used wonton skins for such a thing, and I wanted to do something different. That’s when the lightbulb turned on. What if I stuffed the bacon inside chicken? What if I also added cheese, and some spiced jam? What if I took all that, rolled it up, then breaded it in a cornflake crust? That sounds healthy to me. Pound a chicken breast to about 1/4 inch thickness. Spread a bit of the spiced jam on top of chicken, then a layer of cheese, and finally, top with pre-cooked bacon. Roll the chicken tightly, and hold together with toothpicks. In a small bowl, combine flour and milk. 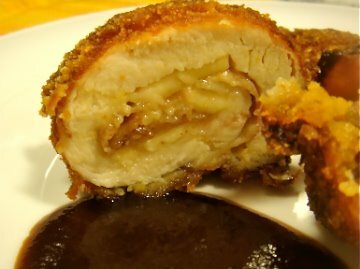 Dip rolled chicken in mix, then roll in cornflake crumbs. If you have time, let sit for at least 30 minutes. Fry at 365 for 6-8 minutes, depending on how thick your roll is. *If you don’t have corn flake crumbs, you can use bread crumbs. Add a bit of salt and sugar to flour mix if you do. 6 thick slices of bacon! 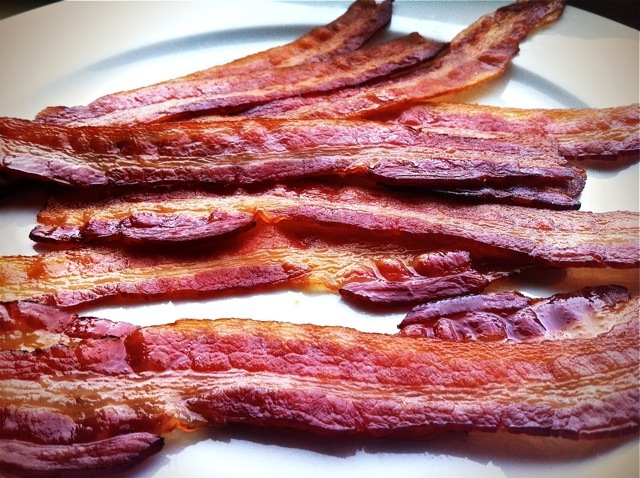 I was having a conversation the other day about the need for another post about bacon. Somehow the subject veered to meatloaf, and I thought, ‘great, meatloaf often has bacon on top of it!’ That was when the light bulb went off. 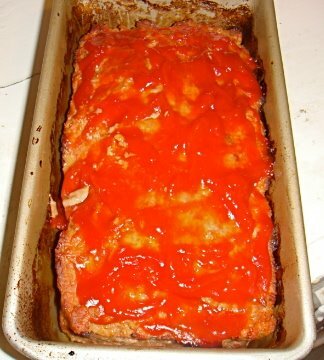 Yes, meatloaf often has bacon on top, but I’ve never seen a recipe with bacon INSIDE! Thus, a new and exciting dish was born. Bacon Filled Meatloaf. 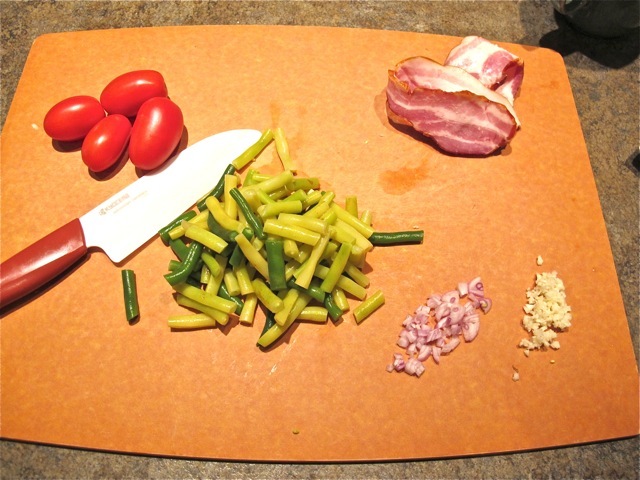 Begin by dicing the first 6 slices of bacon. Remove some of the extra fat. Add to a frying pan over medium-high heat. Render bacon until it just begins to crisp, about 3-4 minutes. This will help the texture of the meatloaf greatly. Drain rendered fat, saving it for another day. 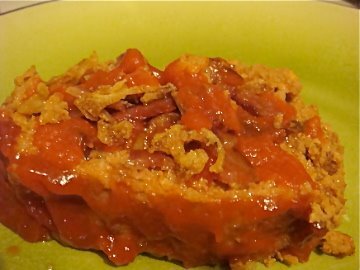 Place the almost crisp bacon in a large bowl, and add all other ingredients save the other bacon slices, ketchup, and fried onions. Mix well (best done with your hands! ), and let rest for an hour at room temperature. Don’t skip the resting. Trust me, you’ll be sad if you do. The mix needs time to let the breadcrumbs and meat absorb all the seasonings. If you don’t let it rest, you’ll end up with a strange textured loaf and a pool of sauce at the bottom. See? Sadness. Put rested mixture in a loaf pan. Put loaf pan in a 375 degree oven. After a half hour, remove from oven and carefully drain most of the melted fat. Cover top of loaf with a layer of ketchup, then cover pan with foil. Return to oven and cook additional 30 minutes, removing foil for the final five. At some point, cook the additional slices of bacon. Rest, covered, for 10-15 minutes. Again, you’ll be sad if you don’t do this. After resting, cut into slices to serve. Top with a little more ketchup or crushed tomatoes, just a dab. Top that with extra bacon (crumbled), and, if you’d like, some canned fried onions. Note: This one is still a work in progress. I’m going to play a bit with fresh onions and garlic, though I do like the convenience of using powdered. 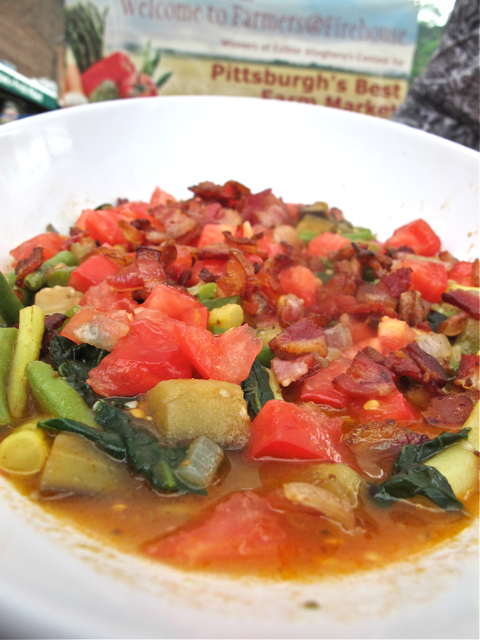 This was made using thick sliced bacon, so if you only have thin, use more. Meatloaf is a million times better the next day. I’m not saying you have to wait a whole day to dig in, just that you should dig in again the next day. When you read my blog, you probably think all is great in my kitchen. Pretty true, but I have a problem, a big problem. I have too much bacon. You see, I’m a fella who lives alone. Sure, sometimes I’ll cook a big meal that involves a fair amount of bacon, but, the reality is, I usually have more bacon than I know what to do with. 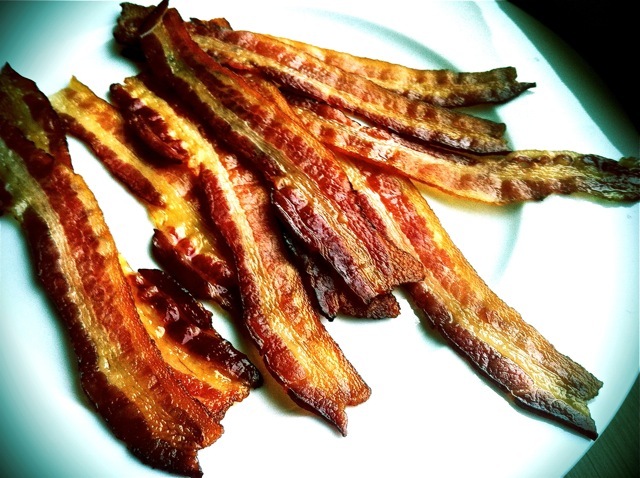 More than four slices of bacon per serving is gluttonous. 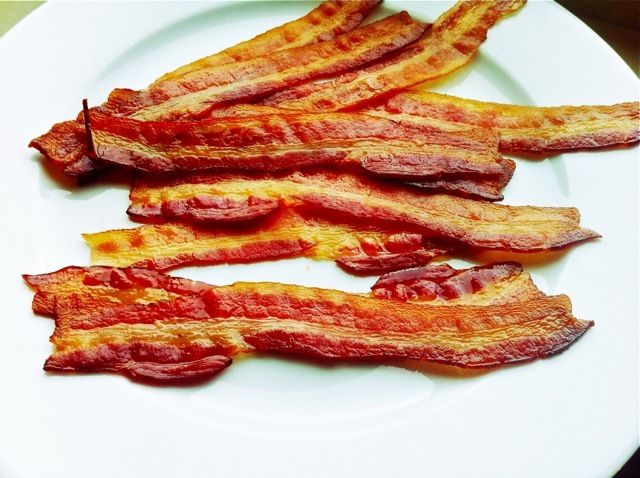 Bacon every day isn’t very good for you. But leaving extra bacon to go bad in the fridge isn’t very good for you, either. Have a problem, find a solution. My solution: freeze the bacon. I don’t know why I’d never thought of this before. So much bacon gone to waste or waist. Poor tasty pigs. Poor gluttonous belly, overstuffed with bacon. Well, that’s not a problem anymore. 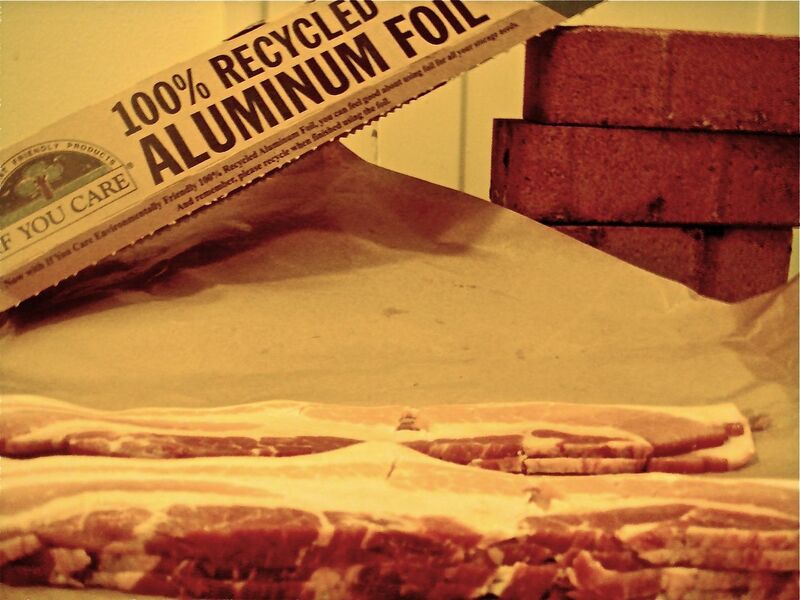 This simple solution will allow you to have bacon on hand whenever you need it. Whether you just need a slice to enhance a dish, or if you’re going for a full breakfast, just open your fridge! 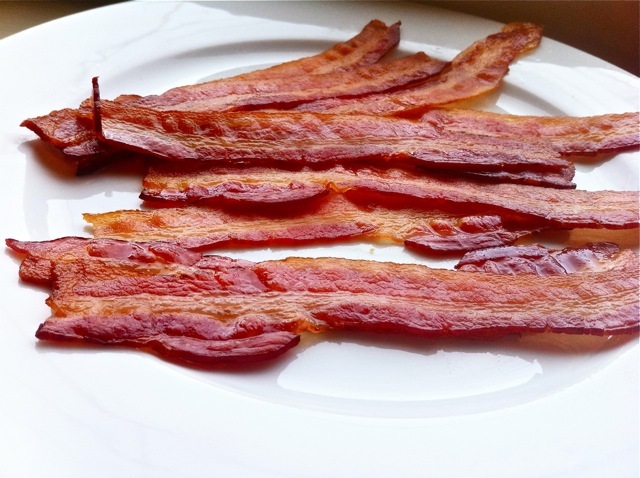 1: Set aside two to four slices of bacon. You’ll see why soon. 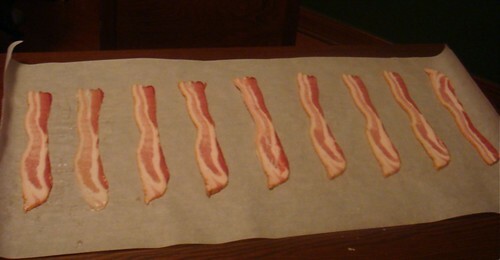 2: Lay out a sheet of parchment paper. 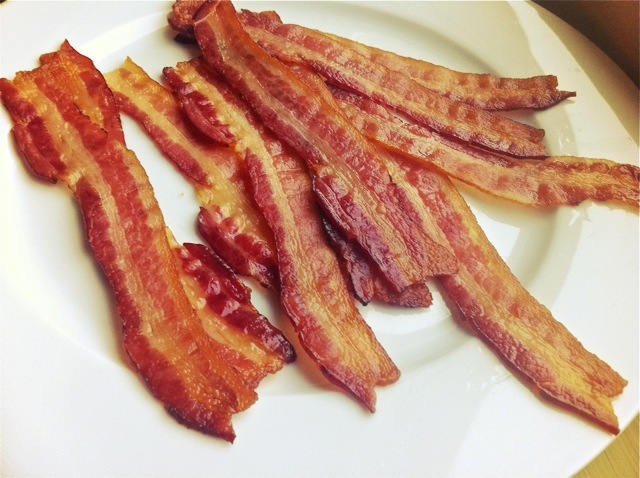 3: Place bacon on paper, leaving a slice-sized space in between each one. 4: Roll parchment over each slice, stacking on top of each other. 5: Wrap parchment roll in heavy foil. This will prevent freezer burn. 6: Place the wrap in a plastic freezer bag. This will keep nasty smells away from tasty bacon! 7: Place in freezer. The roll will keep for three months, but I doubt it will last that long. Use as needed. 8: Cook the bacon you set aside and eat it. You can’t work with bacon without enjoying some! My friend Nico found this on xkcd.com. 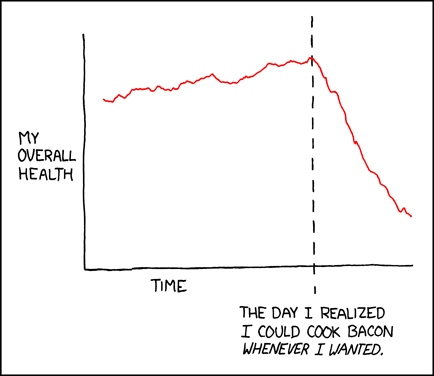 I would like to add another line on the graph representing happiness of the belly, which would go up exponentially as bacon consumption increased.